May 31, 2012 - Gulfstream Aerospace Corp.'s super mid-sized Gulfstream G280 recently set an unconfirmed city-pair speed record from Paris to White Plains, New York, making the flight in 7 hours, 40 minutes. Official recognition of this city-pair speed record by the National Aeronautic Association (NAA) is pending. 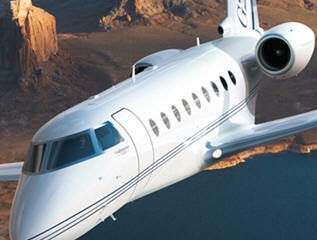 The Gulfstream G280, previously known as the G250, is an improved version under development by Gulfstream and IAI. The G280, which is nearing certification and entry-into service later this year, took off from Paris Le Bourget Airport on May 17 and flew nonstop to Westchester County Airport in White Plains, New York, at an average speed of Mach 0.80 against an average 32-knot headwind. At maximum takeoff weight, the aircraft climbed to 43,000 feet in 22 minutes. The aircraft landed with an excess of NBAA IFR fuel reserves. Piloting the G280 were Brett Rundle, chief pilot, mid-cabin; Chip Leonard, senior international captain, mid-cabin; and Butch Allen, senior production test pilot. On board the aircraft were Jeanette Brewer, manager of flight crew operations, and three additional passengers. Gulfstream confirmed in October 2011 that the G280 would perform better than originally promised at the program's public launch in 2008. Following extensive flight testing, Gulfstream demonstrated that the G280 flies 3,600 nm with four passengers at Mach 0.80 with NBAA IFR reserves. In addition to more range, the aircraft offers a shorter balanced field length. Its balanced field length has been reduced from 4,960 feet to 4,750 feet. This field length is an improvement of more than 1,300 feet compared to the G200 that the G280 replaces. The G280 boasts the largest cabin in the super mid-sized class. With a stand-up height of over 6 feet and a cabin length of nearly 26 feet, the G280 has the most cabin volume and over 17 percent more floor area than the competition. Inflight access to the baggage compartment, along with numerous closets and cabinets within the cabin allows for 154 cubic feet of usable storage. An abundance of natural light is provided through 19 large windows. Quiet cabin sound levels, a low 6,000 feet cabin altitude at 41,000 feet and 100 percent fresh air reduces fatigue and creates a comfortable environment to work or rest.